Plants often produce a late flush of flowers in Cornwall if the autumn is mild. 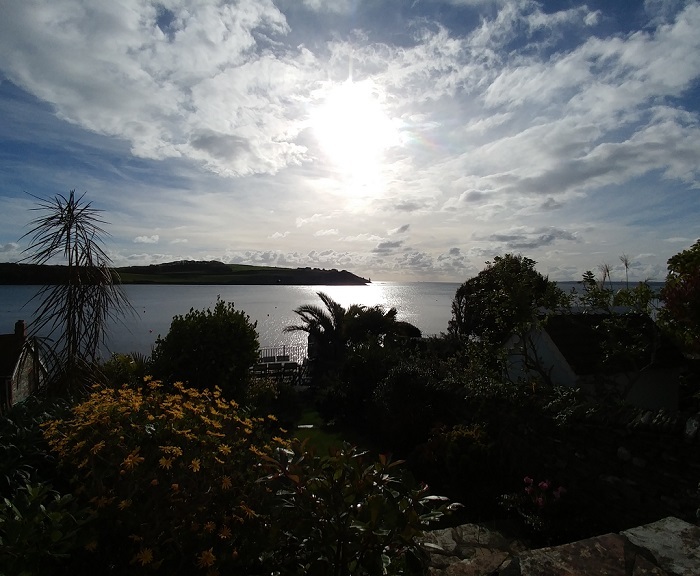 Here are some examples from a visit to St Mawes on 6th November 2016. St Mawes is located in the Roseland Peninsula on the south coast of Cornwall. The photos are taken from a walk along Lower Castle Road which faces the sea, and is sheltered (most of the time!) from the worst of the weather by St Anthony's Head and it's location, just inside the Fal Estuary. An old Rosemary Bush, with a second flush of pale blue flowers in November. The pink flowers to the right are Osteospermums (Cape Daisy) flowering on into autumn. Many Cape Daisies survive as perennials in Cornwall. The plant top right is a Cabbage Tree, also enjoying the milder winters here. 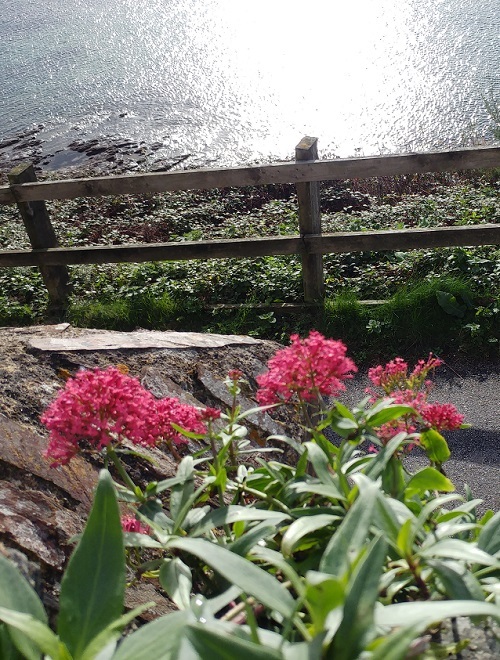 Red Valerian is a Mediterranean plant that has naturalised in Cornwall, often seen growing in Cornish Hedges and old stone walls. 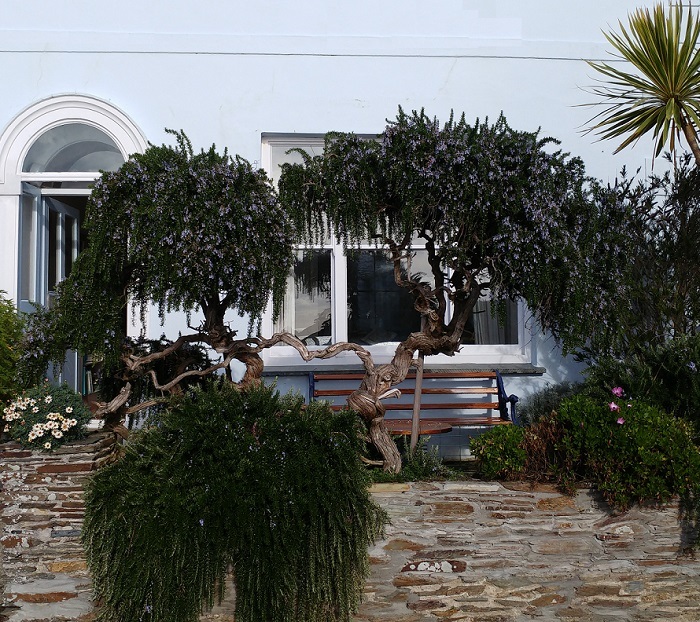 It normally flowers in early to mid summer, but here can be seen flowering well into autumn above the steps down to Tavern Beach opposite Hotel Tresanton. 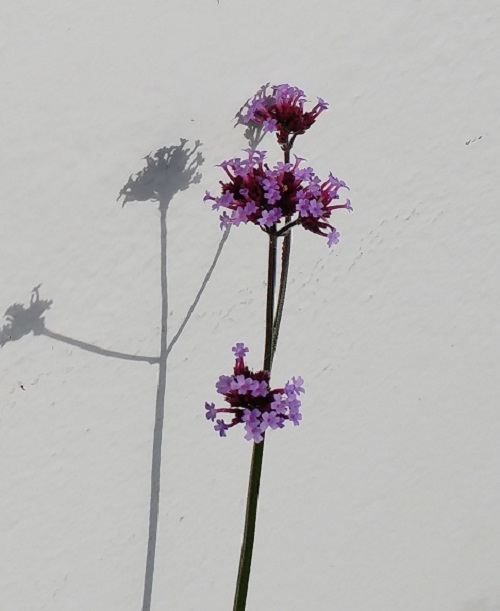 Verbena bonariensis flowering along the road at the base of a white-washed wall. These plants are originally from South America and are popular hardy garden plants. This one has escaped and is growing on the side of the road against a white washed wall. 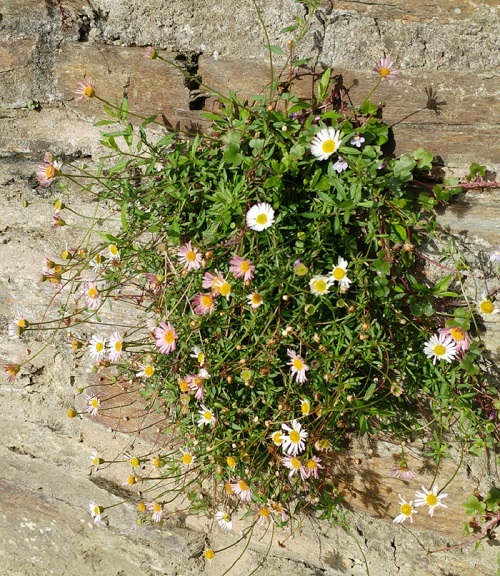 Mexican Fleabane (Erigeron karvinskianus) has also naturalised in Cornwall and grows wild in stone walls. They are evergreen in mild winters and can flower all year in a sheltered spot. The flowers are white when they first appear and then darken to pink which is why a plant appears to have both white and pink flowers. I like this exotic looking garden over-looking the sea. There are some lovely small gardens on Lower Castle Road facing out to sea towards St Anthony's Head. 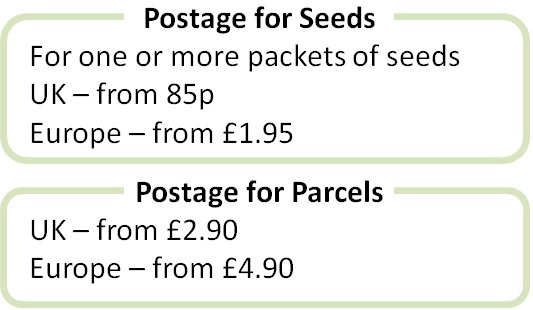 Many are south facing and have a micro-climate that appears good for growing exotic plants. It seems surprising the gardens are not more battered by the wind and sea spray, which despite being more sheltered in the Fal Estuary, can still be strong in winter. The 'spikey' plant on the left is a New Zealand Pseudopanax, a great architectural plant that grows well here and creates an attractive silhouette against a big sea and sky. I will re-visit Lamorran Gardens in St Mawes next year, a wonderful garden rolling down the hill towards the sea, with a camera and post some photos for you.